Digital turn became a professional reality for historians, because new ways of storing, processing, and studying information were included in the everyday toolkit of historical research. No wonder that the problem of the digital turn in history has become one of the main topics of the International Congress of Historical Sciences in 2015. The digitization of historical sources, electronic reference databases and digital existence of historiography are successively changing the historian’s craft. Digital reality has a significant impact on historical research, and it’s time to examine the features of the research practices of historians and to consider the features of digital instruments for analysis and visualization of historical information. 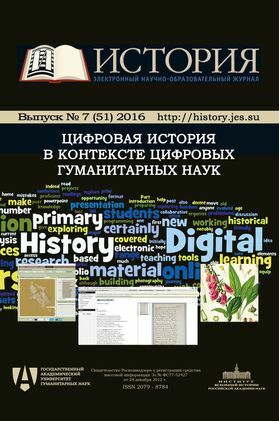 For these reasons, in the special issue of the journal, we decided to examine the role and place of interdisciplinary research area of “cifrovaja istorija” (digital history, histoire numérique, Geschichte digital, storia digitale, digital historia) in modern historiography and in the wider context of the Digital Humanities. This issue consists of three sections devoted to digital history, digital humanities and quantitative history. Discussion of the issue about digital, historical and even wider humanitarian studies is truly international, including articles by Stephen Robertson (Director of the Center for history and new media), Willard McCarty (Professor at King’s College, London) and Franco Moretti (Professor, Stanford University). Special Effects or, The Tooling is Here. Where are the Results?